McCann Australia has continued on its winning streak with train advertising at Cannes winning the prestigious Creative Effectiveness Grand Prix for its V/Line ‘Guilt Trip’ campaign. The award follows the agency’s record-breaking performance at last year’s Cannes Festival of Creativity when its Metro Trains campaign, ‘Dumb Ways to Die’, scored the title of most awarded campaign in the history of the festival. 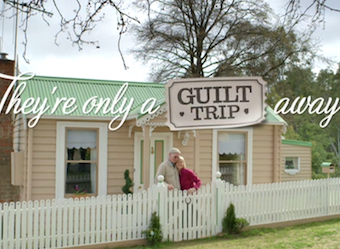 The V/Line ‘Guilt Trip’ campaign encouraged city dwellers to travel by train to visit friends and family in the country, flaunting dry Aussie humour and playing on the concept of “no force more powerful than a mother’s guilt”. The campaign grew total off-peak monthly sales for V/Line by 15% and boosted call centre enquiries by 28%. Executive creative director John Mescall said: “I don’t think there’s ever a better feeling than putting a great idea into market, and having that idea be the impetus for business growth. It’s what we do and it’s why we’re here, so the Effectiveness GP is just so gratifying for us”. Other Australian winners of the Cannes Lions Effectiveness awards were DDB for its work with McDonalds and Havas for its Virgin Mobile campaign starring Brad Pitt’s brother. International winners in the category were UK agencies Ogilvy & Mather for Expedia, Wieden + Kennedy for Lurpak, Publicis London for Depaul, and Ogilvy Brasil for Dove Real Beauty Sketches.